If you’ve already accumulated “flight hours” with the drones of less than 150 dollars that we recommend in our buying guide drones, you’re probably ready or directly want to move to a higher level involving a complete equipment, better performance but also substantially more expensive. The ceiling, this time, we have put in 1,500 dollars. Our next installment of the shopping guide drones focuses on models several steps above the more affordable but without being exclusive to professionals. If you want to take your new hobby seriously and plan fun flying them on one hand and on the other makes quality photos and videos during the flight, these are seven of the best you can buy drones. When we raise our catalog drone, the manufacturer Phantom should not be neglected. His reference model par fans are the Phantom 3, great value for money. A multimedia level, the most interesting of this model is that it includes stabilized camera capable of taking photographs of 12 megapixels (sensor 1 / 2.3 inches) and record quality video with 2.7. That camera can remove and add another. Maximum flight speed can reach 60 km / h and autonomy we have 25 minutes. The maximum distance that can let go of this drone is far from affordable drones we saw. This may be about 1000 meters, also having a button to return to our position automatically, or do the same in case the control signal is lost. It also has GPS to collect accurate flight and information areas. Despite the quality and precision of control (rechargeable via USB), this drone Phantom is complemented by a smartphone application that communicates with the drone via WiFi. With it we can have on the smartphone screen both telemetry information Drone (speed, altitude, position …) and images from your camera. The model Phantom 3 Standar, the most affordable (and then there Advanced Professional editions), goes for about 800 dollars. Which began fever drones in many markets at the consumer level, Parrot, has not left out the part of the catalog includes more ambitious models. The reference model of the company is the Parrot Bebop Controller a model the less different in many respects. The base product is the Bebop drone, less forceful and ambitious appearance than other models of this selection (but with the added bonus that their parts are easily replaceable in case of an accident), but it brings where we want: stabilized flight recording video. In the second paragraph, the Parrot Bebop has 14-megapixel cameras (RAW file included) that record 1080p quality video. Their quality will help us if we do not intend to give the drone this multimedia use as principal. If so, keep in mind that we cannot couple it other cameras since that includes is integrated. This drone has a range of 250 meters and a maximum speed of 46 km / h, it Includes GPS and two batteries for a total flight time of 22 minutes. A very interesting bonus Parrot model is that it is compatible with virtual reality, and can attach to helmets to go beyond the flying experience. The basic control goes through the appropriate application and the smartphone or tablet, but it is more advisable to opt for self-control that attaching a tablet, for example, and rather improve the flying experience. The Tali H500 Walkera, other reference marks in amateur and professional drones, is a model of hexacopter type of large and, once we have experience allows us a stable and where we can focus on recording flight video and taking pictures. The integrated camera is capable of taking pictures of 12 megapixels and 1080p video recording; you can be exchanged for our own model, which will be stabilized with the accessory. Which integrates is ideal for flights of up to 25 minutes, which is the battery life, in FPV mode. The video streaming can continue seamlessly integrated his command screen, one of the most complete of its category. It is comfortable with twelve channels, many options and configurable. The price of this Tali H500 is about $ 1,000. It is considered the drone direct competition Phantom, and no wonders. The Yuneec 4K Typhoon not only has a spectacular appearance but its specifications are the best in the market in its price range, which starts from 1,300 dollars. The most striking of its data sheet is the camera capable of recording video at 4Kor a very interesting way to 120 fps 1080p, i.e. slow motion 4X. The photos can make a 12 megapixel RAW. That camera is stabilized thanks to a 3 – axis gimbal can be controlled from the control (CGO3 type). Between flight modes include one that follows us and one in which we are focusing at all times flies over us. The maximum range is 800 meters to the expert mode, but we can limit it to 300 meters initiated. The control knob, ST10 + Personal Ground Station, is actually an Android device with 5.5 – inch touch screen, so the potential for control and management of the options is very complete and without relying on post or link to our own smartphone. An extra point that gives incredible value to this model is the accessory for using the stabilization camera drone with our own smartphone and hand. It is certainly an original and practical way to get more out of a drone whose flight range of around 25 minutes. The latest arrival in the world of advanced drones the stars in the 3DR only. This team will be the first among you by your eyes because their appearance has taken great care and if you’re using GoPro (Hero 3 and 4), the model should choose for its high compatibility. To begin the stabilization for the camera type is gimbal to perfectly suit the action cameras most famous in the world, which even can be completely controlled remotely. The 3DR Solo (autonomy of 25 minutes, 20 in the case of carrying a camera) includes dual – processor management functions for recording without the flight mode you can see penalized. Here you should bear in mind that the command needs a smartphone or tablet to take full advantage. Connectivity is WiFi, with scope for some 800 meters. It is included in the controller itself an HDMI output to play the live video on a larger screen. That comes to smartphone streaming directly from the GoPro. The integrated GPS in the 3DR only does not serve solely to gather information about the flight but to make a particular route, area takeoff or landing and the flight can be disregarded and the operator to focus on getting the best photos and videos with your drone. 3DR only has limited for now the markets where it is available (USA and Canada with direct sales), and is available in two versions: the standard for $1000 and that includes the stabilization system for GoPro cameras, which cost around 1,400 dollars. Another option less known and is around 900 dollars and ready to fly, is the Hubsan X4 Pro , a drone of quadcopter type and whose most prominent value is the gimbal stabilized where a camera moves away with 12-megapixel sensor and records video 1080p. It also includes GPS to manage a scheduled flight. That flight can be 27 minutes on a single charge if we rode the camera system and the gimbal support. If we opt for a session of free flight and no more worries, autonomy grows to a very worthy 40 minutes. Command, quirky design, carries a touch screen 7 – inch (Android operating system) where to receive the first – person video camera. The curious touch is given to this drone system parachute that can be removed if not convince us, and that opens if it detects that the drone will suffer a dangerous or out of control by the pilot landing. For that to happen is not always advisable to resort to button return to the starting point with which account this drone. Of the four models of advanced drones that Horizon Hobby has in its catalog, the Blade Chroma Camera Drone with CGO3 stabilization system integrated camera is the most interesting if we are to buy a ready to fly model. 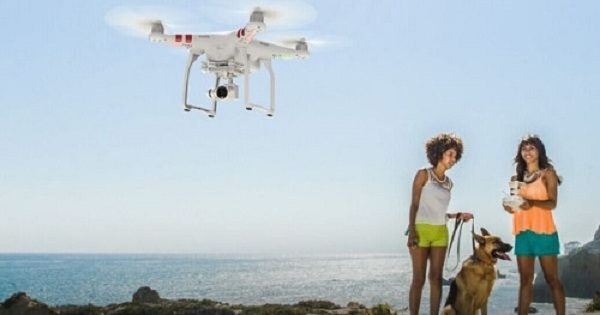 This drone now features a video camera capable of recording 4K. The remote control, an ST-10 + includes 5.5 – inch screen and Android-based operating system. This model is the most flight range offers a single charge of its battery: 30 minutes. Its reach is around 600 meters include GPS data to provide flight or establish a route prior to the flight and that the drone run it in unattended mode. Other flight modes include one for beginners to professionals as well as one tracking our movements and another that continually focuses us as the model Yuneec this comparison. This Blade Chroma is priced at $ 1,200. Separator image Posted in Reviews, Technology News.